Hawkgirl is returning an escapee, when she's contacted by Cyborg and asked to return to the Hall of Justice. Once there, she sees a Thanagarian cruiser. She wonders if Hawkman is about. Hawkman reveals himself and demands Hawkgirl return with him to Thanagar, ordering her to take no part in the struggle on Earth. Hawkgirl refuses, and a battle ensues. Once defeated, Hawkman is ordered to return to Thanagar. Story - 0: Buccellato has turned in a series of languid, indolent, and shiftless issues under his tenure, and this can be pardoned with the caveat that Injustice is to be taken as a trifle; a finite story in a universe that no longer exists. However, this installment was reprehensible in its assumptive posture, that readers will accept a fight with no basis, and for no reason other than Buccellato is aimless in his last days on this title. Hawkman arrives, and the thinnest of excuses, it's a brawl, which of course he'll lose; he's not in the video-game, after all. In what amounts to Hawkman being mentally unhinged, he attacks for what purpose: to have Hawkgirl return with him? If he's victorious in his fight, do we really believe the League will just let him leave with her? Worst of all, Hawkgirl has been gone for years! She's only of concern to Hawkman now? I've reviewed more than a few books at this point, and no title has ever been so low in quality that it could merit a donut, but Buccellato has won the infamous award. I've never written a letter demanding my money be returned for my purchase of a comic, or even contemplated disputing the charge before today, and that's with several years of reading under the belt. Simply put, if you don't want to do the work of writing a proper story, turn the book over to someone who does. Art - 3: This has to be the easiest paycheck earned thus far, and once more, the art chores are serviceable. 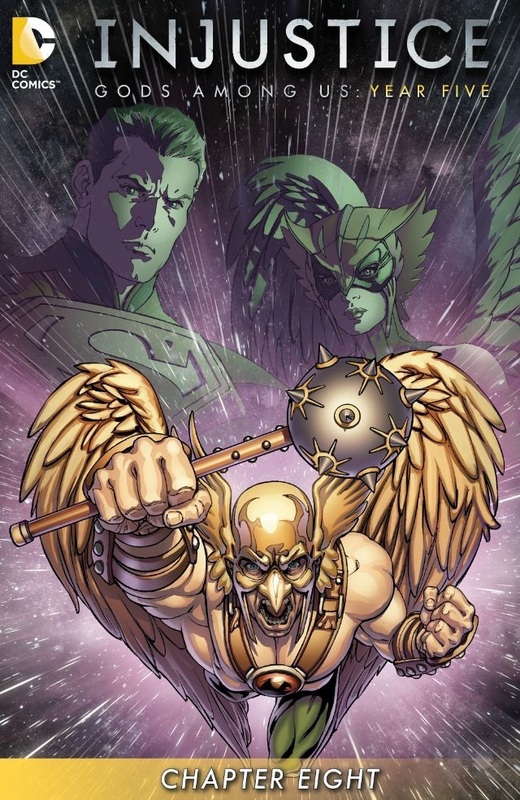 Cover Art - 5: Hawkman? Where the heck did he come from?